Two days have passed since my last post so I’m well on my way. Two blisters have also emerged, but they’re not causing me too much trouble at the moment. Yesterday was a bitingly cold morning, but we were rewarded with a beautiful sunrise for starting early. 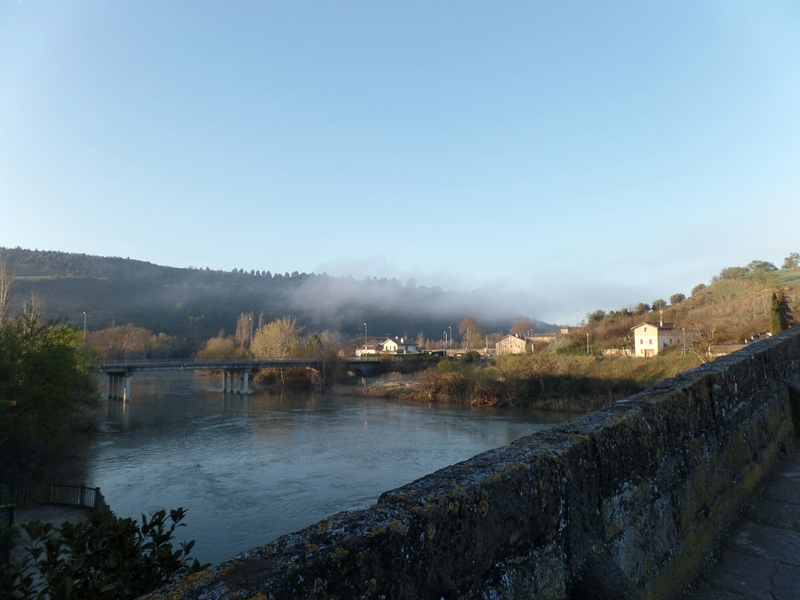 Oxford may have its hazy dreaming spires, but Spain has its dreaming Camino. 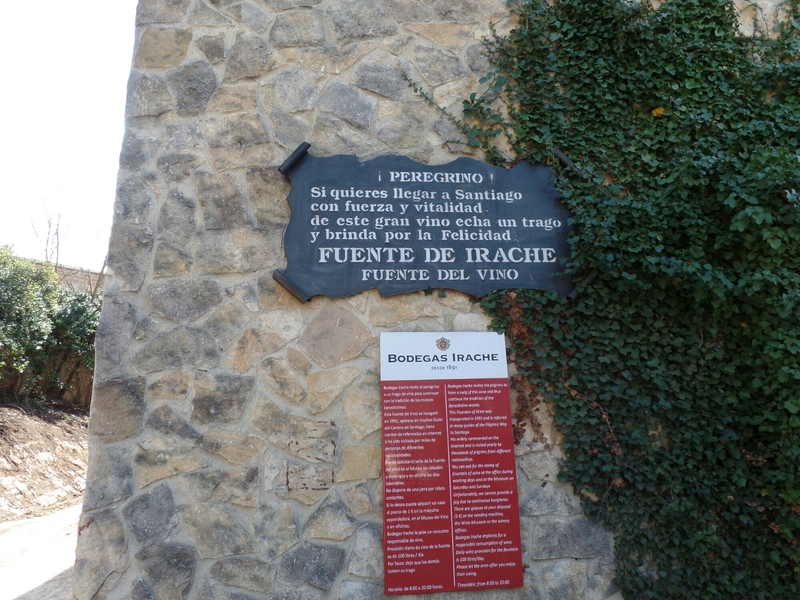 Since leaving Puente la Reina the terrain has changed a little, teasing us peregrinos with miles of vineyards, and hinting that we’re soon to arrive in Rioja country. But before we get to Rioja, there are more green fields and sweeping sierras of Navarre to conquer first. As the sun crept up yesterday my Camino crew and I crept up winding hills picking up and dropping off other groups of pilgrims along the way. 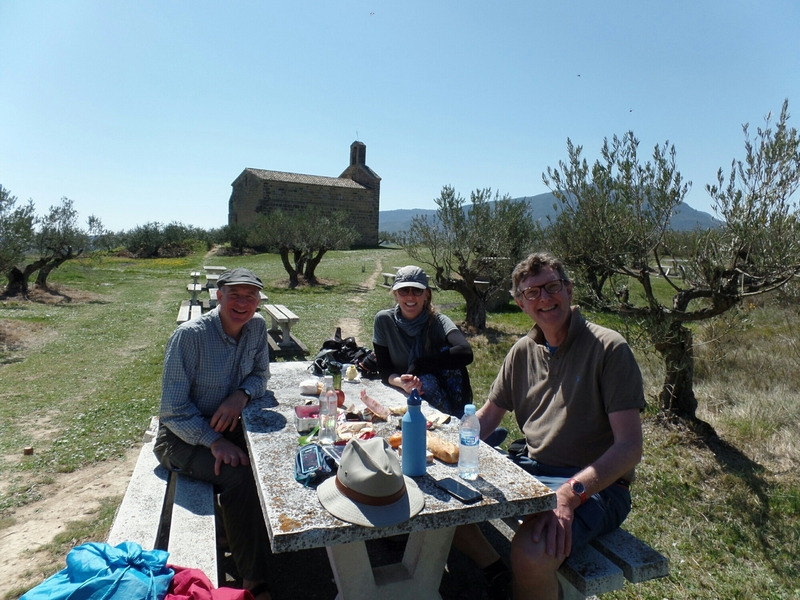 A special mention to John from Amsterdam who found us the most beautiful spot for lunch in a churchyard surrounded by olive trees. 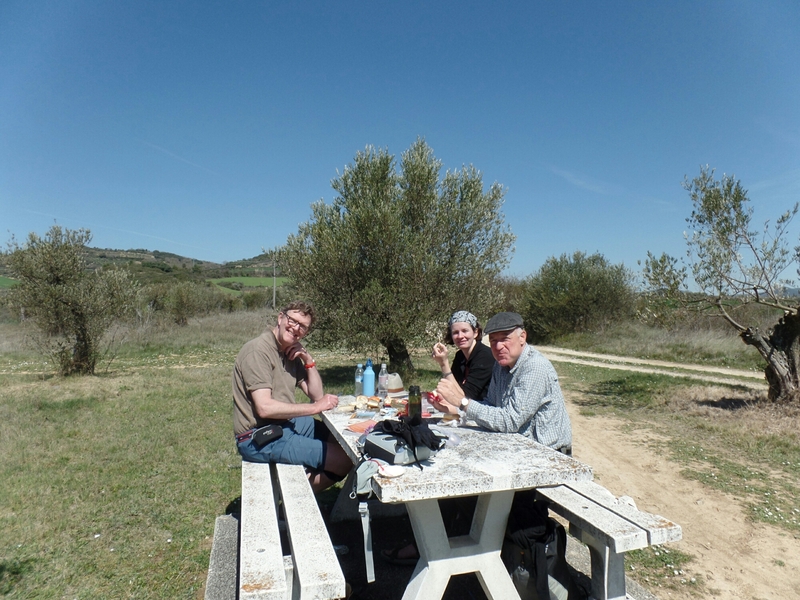 Lunch was a brilliant picnic with everyone sharing a little something from their backpack. Elke’s German bread and John’s manchego were particularly welcome. 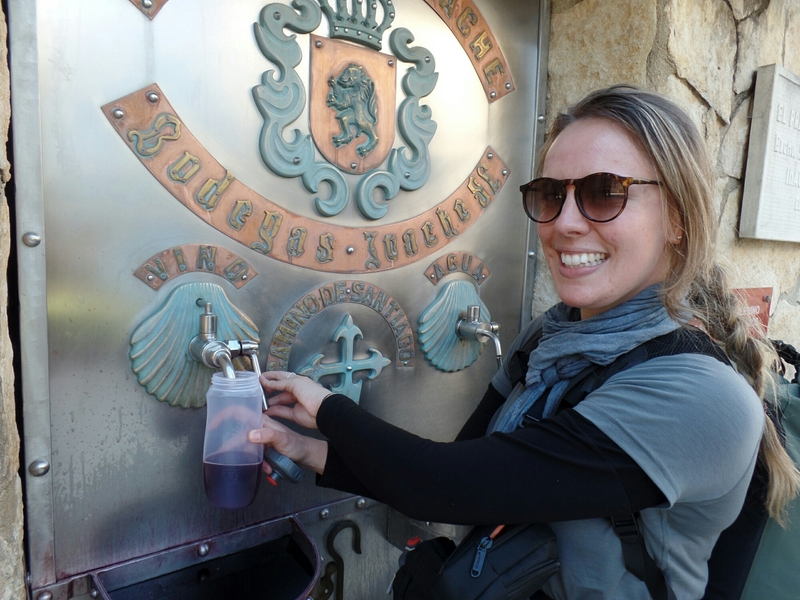 Later that day Elke and I parted ways with John and Paul at a pretty town called Estella which is the typical end point for this stage… We were eager to get to the wine fountain in the evening, rather than first thing in the morning. We were richly rewarded for our efforts on two counts. Firstly… um, wine. And secondly because our onwards walk took us through pretty oak woods to the tiny town of Azqueta. 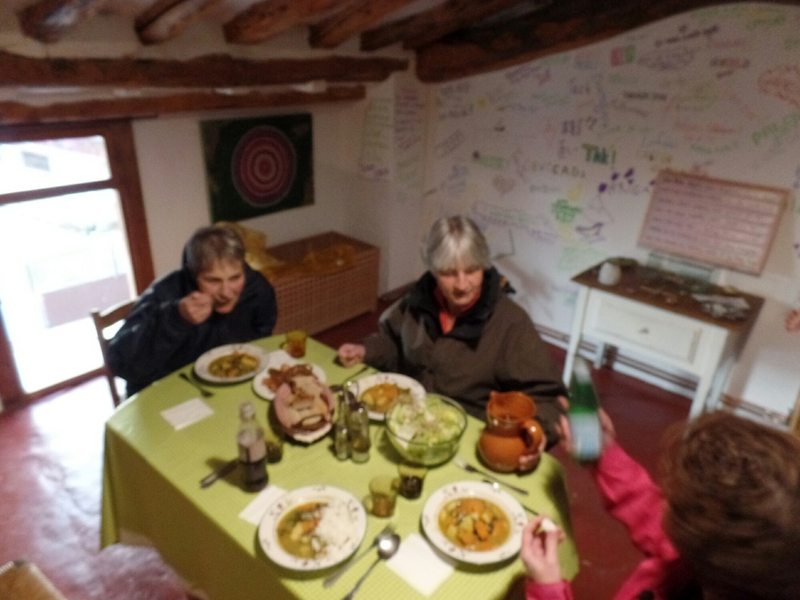 Here we stayed in Elena’s amazing hostel la Perla Negra with three French women who are cycling the Camino. They had also picked up wine from the fountain, so we shared wine from a sports bottle, a Coca Cola bottle (pro tip, red wine in a Coke bottle totally looks like Coke) and a San Pellegrino bottle. Clearly their intended use! We sat on a sunny terrace with swallows circling overhead. A magical moment for weary peregrinas was followed by a delicious dinner. The next day we started a bit later (possibly due to the wine) at the practically decadent hour of 8.30. However, Elke and I have rewarded ourselves for yesterday’s march with a shorter day today. We’re in a hostel in a small town called Torre del Rio with some Spaniards and some Americans we met along the way. Now I’m looking forward to dinner!